One hundred Druze reserve officers, many of them with a rich record of fighting in Israel's various wars over the years, have joined the special forum established in protest against the Nationality Law that passed in the Knesset last week. The law declares that only Jews have the right of self-determination in the country. During talks held with several Druze reserve officers, several of them expressed anger for being excluded from Israeli society after they had served and are still serving the country. Speaking to Ynet, Brig. Gen. (Res.) Imad Fares said, "The feeling is it was decided to burry us outside of the graveyard," "The feeling we are not equal was always a bit present in the street. It's sad, because we've always believed that someday we would be (treated as) equal, but now when it's enshrined into law (this thought) looks farther than even." "I don't understand why this law is necessary. Is somebody questioning that the fact the country is Jewish? This law only creates second-class citizens," he lamented. Fares's son serves as an IDF officer and is other son is expected to join the army soon. "Going to the army is our duty as the citizens of this country. However, I expect the county to treat me as I treat it," Fares added. "The Druze community's loyalty to this country is more profound and serious than any political statement. Why is it necessity hurting us every time to check our loyalty?" the Brig. Gen. wondered. "This law creates unease in the Druze community. The lawmakers would have been smarter if they would have written it according to the Declaration of Independence, which mentions a Jewish country that allows minorities to coexist in it," he elaborated. The law legally enshrines Israel's democratic character, its state symbols, Jerusalem as the capital, Hebrew as the official language and the right of return for Diaspora Jewry. One of the main controversial sticking points of the law was article 7 which defined the development of the Jewish settlement as a national value, and enabled to exclude populations from new communities. However, after a warning from the Knesset legal advisor, the article was altered. The law in its new version states that Israel "views the development of Jewish settlement as a national value and will act to encourage and promote its establishment." The bill also strips Arabic of its designation as an official language alongside Hebrew, downgrading it to a "special status" that enables its continued use within Israeli institutions. The first petition to the High Court of Justice against the Nationality Law was submitted last week by the heads of the Druze communities, followed by three Knesset members, including two from the coalition who also filed a petition to the High Court of Justice on Sunday against the law. The move was initiated by MKs Hamad Amar (Yisrael Beytenu), Akram Hasson (Kulanu) and Saleh Saad (Zionist Union). Brig. Gen. (Res.) Amal As'ad, former commander of the Coordination and Liaison Administration, also expressed his anger saying, "After we built this home together with the Jews, the Nationality Law excludes the Druze community from that home and put it outside the fence." "We encourage the fact that Israel is a Jewish state even prior to its establishment and we will continue doing so with or without the law," As'ad elaborated. "But, for some reason the Druze community was left behind. I've served in the IDF for this country for 26 years and I have the right to demand for it to mine exactly as it is yours," he went on to say. "We intend to take further measures, without making any reckless moves. We are thinking together about our next steps to amend the law," the former commander of the Coordination and Liaison Administration explained. The Druze community has defended Israel prior to its establishment and in 1947 the IDF Sword Battalion in which members of the Druze community served was founded. In 2015, the IDF decided to dissolve the battalion. Former Druze MK Amal Nasser el-Din who serves as the Druze Yad Lebanim chairman lost his son in 1969 who was killed while chasing after terrorists. Nasser el-Din sent this week a harsh letter to President Reuven Rivlin, Prime Minister Benjamin Netanyahu, Defense Minister Avigdor Lieberman and the Nationality Law's sponsor MK Avi Dichter. "I'm very angry. The decision-makers must have forgotten that the Druze are not new here, and should be ashamed of this legislation," he lashed out. "The state has bestowed 160 members of the Druze community the medals of honor. All of Israel's leaders have respected us and now we are thrown to the dogs and even worse. History will judge those who vote in favor of the law, because we are the only ones who stood the test of all of Israel's wars," the Druze Yad Lebanim chairman vented. "I'm having difficulty understanding why to do such a thing?" he wondered. Nasser el-Din who resides in the Druze town of Daliyat al-Karmel added that his community is in emotional turmoil and its anger is directed at the Druze MKs in the coalition. "The community is furious, None of the Druze accepts this, except for Ayoob Kara, who is the "yesman" of the man who appointed him as communications minister. The decision-makers have lost their minds," he concluded. Col. (Res.) Anwar Saab backed Nasser el-Din saying, "We are very angry with MK Hamad Amar that was one of this law's initiatives and Akram Hasson who made deals around that law but failed to look out for the Druze community." "Minister Ayoob Kara also voted in favor of the law," he added. Saab is a member of the senior officers and authorities' heads forum to amend the Nationality Law, with 100 Druze officers recently joining it. "We are acting to lead practical moves to amend the law. There are also Jews who are angry over the fact the Druze community was excluded from being defined as part of the Israeli people," Saab said. "It is important to us that the state remains Jewish, but not at the expense of democracy," he concluded. The passing of the Nationality Law drew harsh criticism not only among opposition members, but also among The Arab and ultra-orthodox sectors. The European Union on Thursday said it was "concerned" about Israel's new Nationality Law, which declares that only Jews have the right of self determination, and said it would complicate a two-state solution to the Israel-Palestinian conflict. 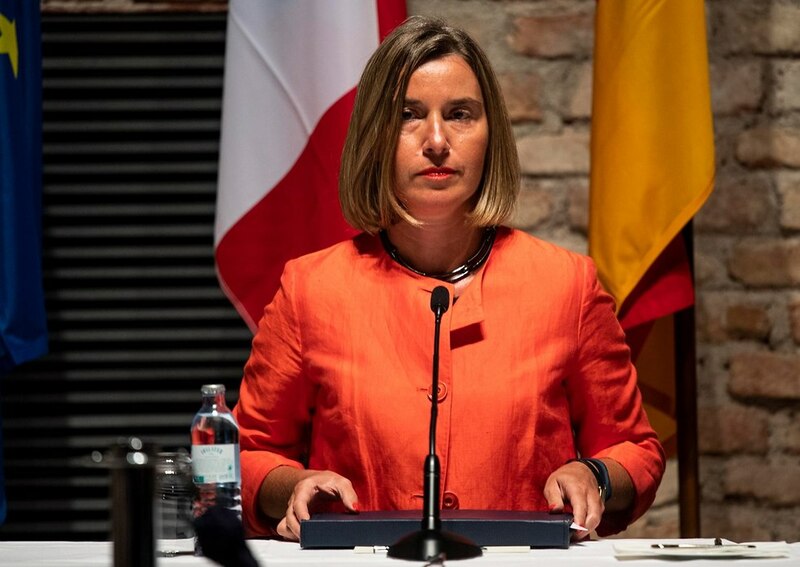 “We are concerned, we have expressed this concern and we will continue to engage with Israeli authorities in this context,” a spokeswoman for EU foreign affairs chief Federica Mogherini told a news briefing. See all talkbacks "Druze IDF officers protest against Nationality Law"